As consumer devices proliferate, each type of device uses different sets of software to make up the total video experience. Software fragmentation has made it an ongoing challenge for video providers to present a common experience - and virtually impossible to use the same combinations of browser, video player and content protection across all devices. To address this situation, several technical standards used together, give content providers and video distributors a set of tools to specifiy the formatting, playback and protection of the video experience without having to address the proprietary software directly. These technologies work together to enable the secure delivery and playback of video delivered over the Internet. 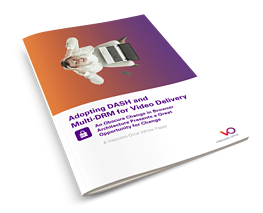 Download the whitepaper to learn how video providers can create consistent, high quality video experiences across devices, and reduce time-to-market.